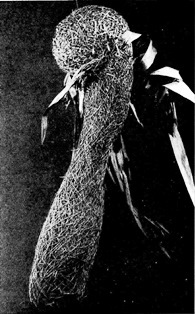 Often long tubed nests are built by solitary, monogamous weavers. This group of weavers usually consists of a pair and they build the nest together. In some malimbes, a group of birds help build a nest. The long tube probably reduces predation but does not stop all predators. In the polygnous weavers it is usually the male that builds (although the female adds nest lining) and males want to build many nests in a breeding season, rather than spending energy on building nests with long tubes. In the nest on the left, the tube is not particularly long by the above standards (nests with tubes of 20+ cm long), but this tube is considerably longer than what Cape Weavers normally build. 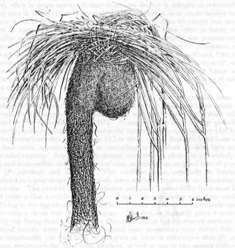 Longer than usual tubes could occasionally be found in any weaver nest.